This paper presents information aimed at stimulating a concern for productivity improvement with good feeder choices for cold forming. Cold forming processors are encouraged to consider all features which will provide reliable, full function, long term service at a reasonable cost. All feeder choices should include full consideration for reliability, life term, flexibility, parts abuse, lube loss, noise, floor space, storage volume, production rate, and serviceability. There are more than a hundred parts feeder suppliers on the North American continent. At least a dozen of them have been around for more than twenty years. Most specialize in bowl feeder technology, but several long timers offer a wide range of feeder concepts to meet specific needs. Despite its potential contributions to cold forming profitability, feeder technology gets little attention compared to production materials, lubricants, dies, and forming machinery. Too frequently cold forming process operations are negatively impacted by casually applied feeders. This presentation is dedicated to stimulating a concern for productivity improvement with good feeder choices. Cold forming processors are encouraged to consider all feeder features which will provide reliable, full function, long term service at a reasonable cost. All feeder choices should include full consideration for: reliability, life term, flexibility, parts abuse, lube loss, noise, floor space, storage volume, production rate, and serviceability. Normally, too few of these items are considered until after the equipment is installed. Gravity orienting floorbin elevators (Figure 1) are widely used to feed simple rolling and sliding part shapes to a variety of operations. Easy access low profile parts storage is provided (one to seventy cubic feet) with low cost orientor tooling. Careful elevator cleat and tooling design will, sometimes, permit handling a small family range of parts with minor adjustments. When parts must be face or end selected for hubs, chamfers, radius edges, holes and other features, the price can escalate substantially. Simple face selection will reject improperly oriented parts back to the floorbin for another try. Short shafts, cubes (diameter = length), and thick discs are far less efficiently fed in a gravity orienting system. Hence; more recirculation with accelerated: tooling wear, parts abuse, lube loss, and noise. 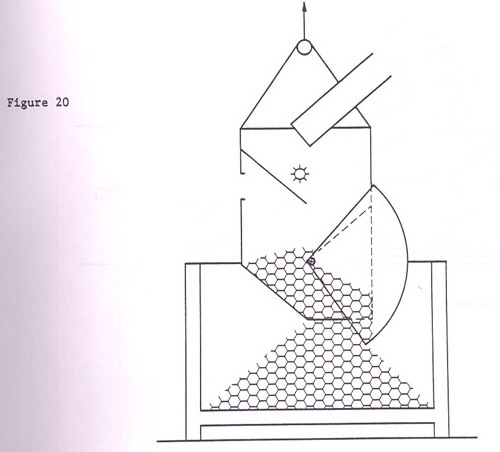 Some difficult shapes can be fed more efficiently by the addition of a mechanical orientor which may work too slow. The selector can be designed to keep all elevated parts by reorienting those which are sensed as incorrect. These extra features will cost more but may improve feed rate and will greatly reduce noise and parts abuse by avoiding recirculation. Gravity orienting floorbin elevators are difficult to retrofit for revised or new part shapes. They are not as adaptable to complex parts as other feeder types. Tramp materials and heavy oils or lubricants on parts can greatly affect performance problems. Such units will easily feed 30 pound parts at 10 to 20 pieces per minute. Careful review of part design(s) and handling conditions is essential to pre-qualifying the use of gravity type orientors. 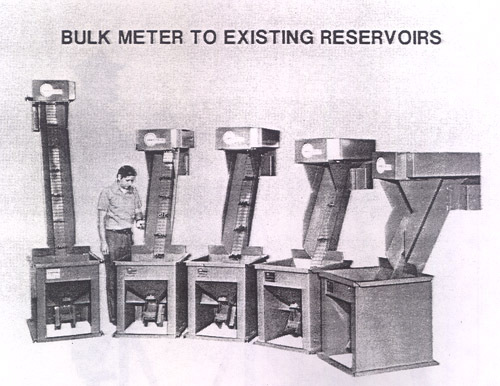 By itself, the Vibratory Bowl (Figure 2) is the most popular and usually the lowest price feeder concept. First used in the mid 1940’s, it has been developed and improved to handle a broad variety of smaller part shapes. Such units are available in sizes from 6 to 48 inch diameters and selected by using a 15 to one multiplier of the parts largest dimension. They will not hold a large volume of parts without a performance sacrifice so backup hoppers are often added to meet storage needs. Because all the parts in a bowl are being vibrated, there are penalties to be considered. Parts and tooling abuse, noise, and loss of die lube are but a few concerns for agitation of so many parts at one time. Bowl fabricators are stainless steel to get some wear resistance. The tooling is not designed but fitted by trial and error artisans to finally perform the needed function. A part change may require an artisan to retrofit the original bowl tooling to obtain acceptable performance. Seldom are parts’ families fed with a single bowl feeder because of limits to adjustability in the tooling. Bowl feeders can be exchanged to convert from one part shape or size to another. The low price benefit of bowl feeders is often nullified by a need for multiple units for handling parts’ families. When a vibratory bowl feeder: exceeds 24 inches diameter, must feed a parts’ family, or requires a backup supply hopper, much of its low price advantage over other feeder types is lost. Many other benefits and detriments are open to detailed discussion regarding this very popular feeder concept. 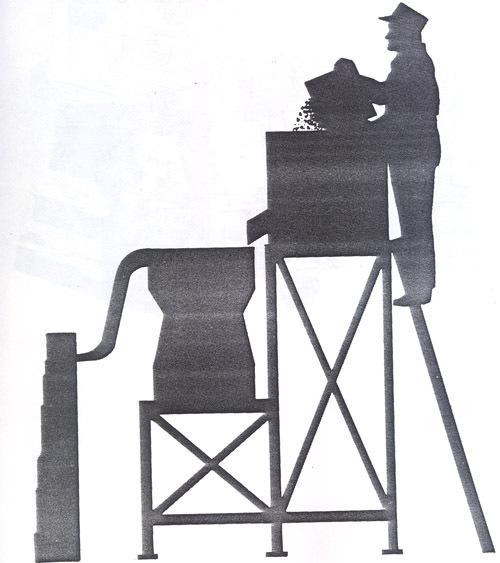 Typically, a vibratory bowl feeder application may look like the silhouette in Figure 3. Total price for the bowl, drive, feed track, sensors, backup hopper, support structure, and stock handler can add up to an expensive investment compared to the concept benefits. Consider the hidden cost of workers compensation risk – even with a better ladder. 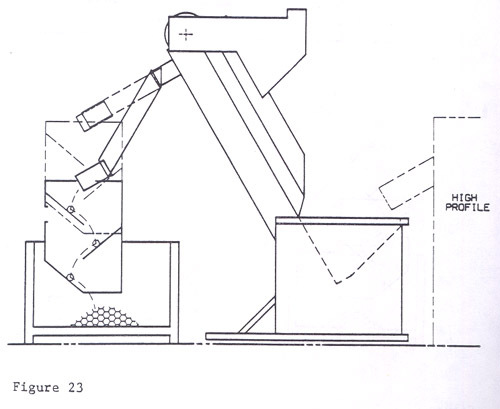 Figure 4 shows typical floorbin elevators used to deliver stock to overhead bowl feeder reservoirs. This application should be considered only when an existing vibratory bowl feeder needs a better supply system. 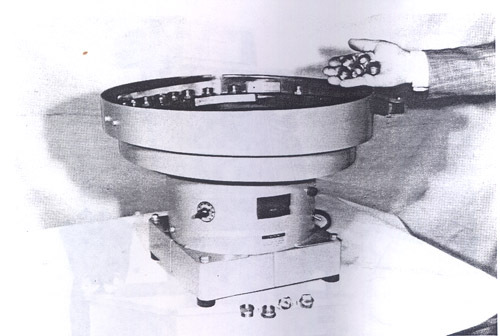 Straightline vibratory orientors are a relatively new concept compared to the bowl feeder. They both use the same operating principle, but with straight versus helix flow paths for parts orientation. The straightline unit (Figure 5), by itself, does not store parts like a bowl. It requires the metering of parts from a floorbin elevator. Misoriented and surplus production parts are returned to the bin. 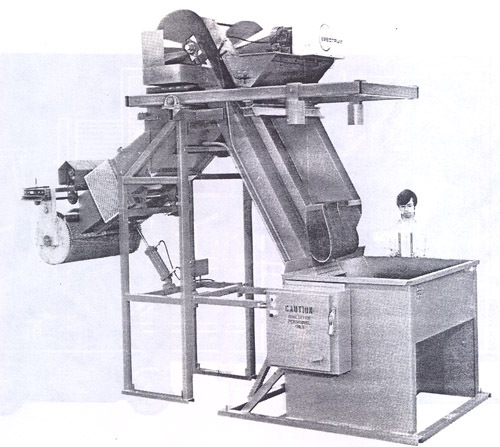 A combination floorbin elevator and straightline orientor is often priced less than a bowl feeder with a backup hopper and its related support media. Fewer parts move in a straightline orientor than a comparison bowl for the same production effort. Hence, less noise, less parts abuse, and extended feeder life. Straightline orientor tooling is designed, bolted-in, and hardened. Tooling plates can be furnished to permit non-technical, quick changeover for parts families (Figure 5). Tooling retrofit for changed or new parts is easier with the bolt-in straightline concept. Extra tooling to preorient, sort, live feed, and distribute to multiple paths is normal for the straightline concept. In some cases tandem vibratory drives are used to provide enough tooling to perform more complex tasks (Figure 6). Despite the occasional recirculation of parts from the orientor to the floorbin, the straightline concept preserves part quality via gentle handling and efficient tooling. 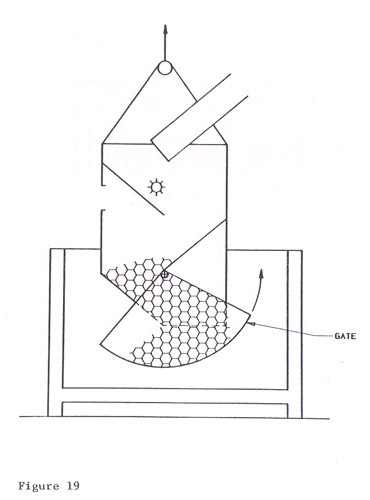 A family of cold formed ball studs is fed to thread rolling and then to cross hole drilling without damage to cold finished surfaces or thread quality (Figure 7). 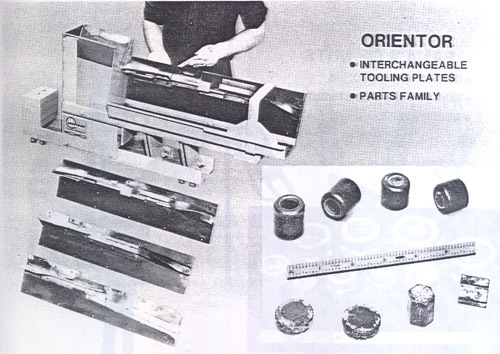 Straightline orientors are qualified to feed fifty pound parts. 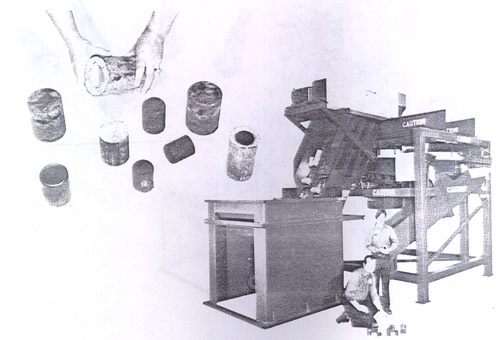 A family of heavy steel billets and preforms are oriented and auto fed to die lube coating baskets (Figure 8). Surface integrity is preserved on large preforms for secondary hits via simple vibratory straightline tooling (Figure 9) on heavy duty floorbin elevators. Preorienting tooling features allow minimal recirculation to the bin. 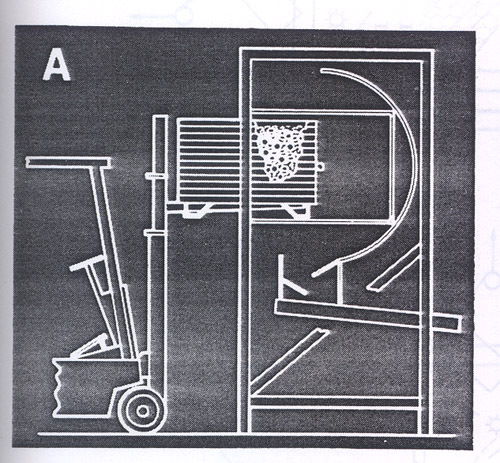 Smaller parts are stored and oriented in a combination of two straightline vibratory drive units (Figure 10) without a floorbin elevator. One-sixth cubic foot of parts is stored in the recirculation trough. Such a unit can be used with a floorbin elevator where recirculation to the bin is not permissible because of fragile parts factors. Straightline bolt-in orientor tooling provides many extra features for better handling of parts. There is much extra capacity to perform more functions than a vibratory bowl. Frequently special sensors are added directly into the orientor tooling to detect difficult-to-orient shapes or colors. Mechanical ejectors and/or manipulators are added to perform selections not possible with pure vibratory tooling. Lasers, infrared, proximity and vision devices are also employed with straightline tooling for a variety of functions or checks. Extra information has been furnished with this presentation regarding straightline vibratory feeding features. The purpose is to advise the reader about lesser known concepts which, when understood, can be applied with greater payoff. There are about a half dozen parts feeder sources that offer straight-line vibratory orienting units. Non-orienting bulk feeding systems are often employed to store, elevate, and discharge parts for lube coating, washing, and heat treating processes. A floorbin elevator with a weigh and discharge module (Figure 11) can be set to release accurately accumulated batches of a variety of parts to many bulk processes. By adjusting elevator speeds it is possible to continuous feed bulk parts at a fairly reliable pieces-per-hour or pounds-per-hour rate without a weigh and dump module. Each application must be judged on specific information about process flow tolerances and part shape. Bulk metering can be done with a variety of concepts that preserve product quality while getting parts to and from essential processes. Even simple conveying can be classed as a technical effort with many concepts to choose from. Another important factor in parts handling is the gentle removal of product from stock boxes or gondolas. Lifting and dumping gondolas from the floor level is done by several sources of standard machines. Most employ hydraulic cylinders and an integral power pack to do the work. In order to avoid safety problems, they should be enclosed to restrict personnel involvement during the dump cycle. This concept is very common and well-known. 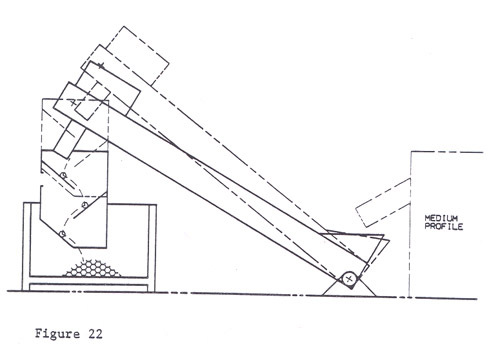 Another kind of stock box dumper employs a rotary cradle positioned above the discharge point (Figure 12). It permits a straddling of the discharge target and far less safety concerns. 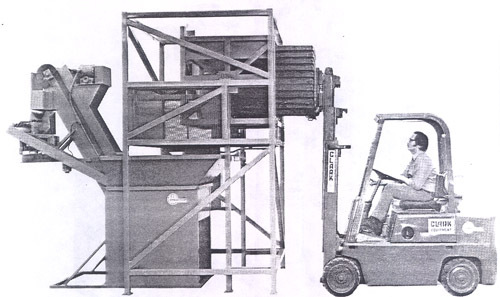 The rotary cradle permits full upending of boxes for complete evacuation of contents. A further improvement on box dumping techniques is the addition of a fixed fender in a rotary gon dumper (Figure 13 A-B). The fender restricts parts flow until the box spill lip is at a low point for a limited parts fall. 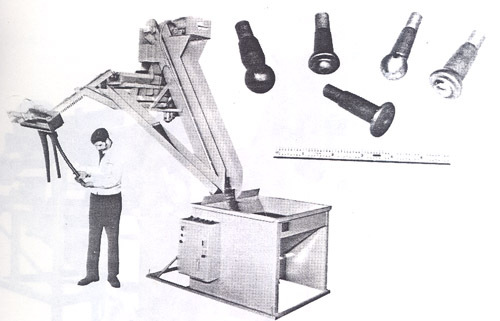 Many fragile parts are now handled by the rotary, overhead, fendered dumper concept where manual handling was mandatory. Cast aluminum automotive engine pistons are now control dumped without concerns for damage. Finished planetary pinion gears are auto-dumped for reorienting and final gaging with the fendered rotary dumper concept. 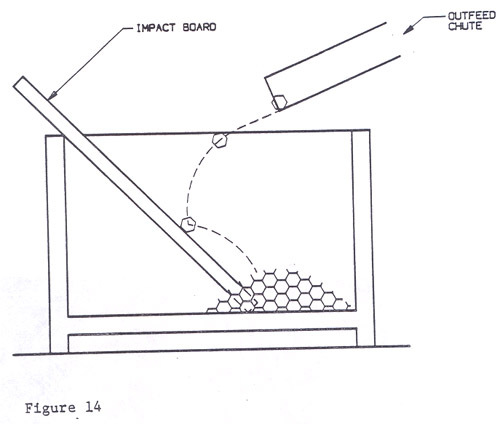 Until recently, a manually positioned impact board was the typical tool to get delicate parts into stock boxes (Figure 14) from process chutes. An improved stock box filler concept was recently developed for several gentle handling projects. 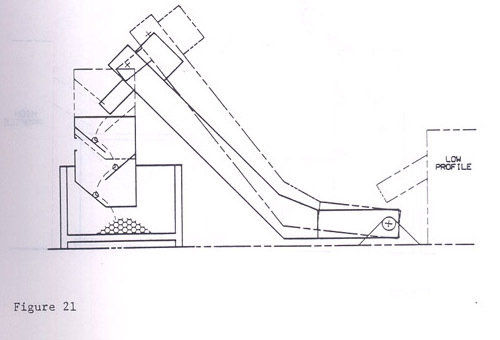 It uses a vertical, baffled, down-chute to flow parts into bins with a controlled free-fall path (Figure 15). Parts are evaluated for system application by drop tests to determine maximum free-fall impact without loss of quality. A down-chute is then designed to control free-fall accordingly. Final limited fall to the bin bottom is set by the down-chute suspension media. 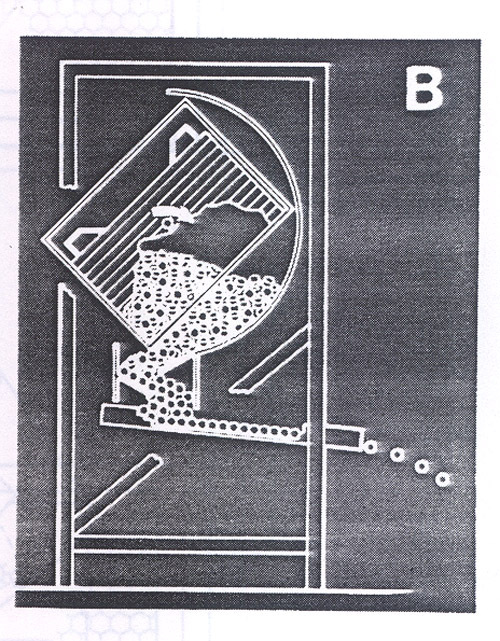 When parts fill the bin bottom and backup into the down-chute, a sensor or stock attendant will react to raise the chute (Figure 16). 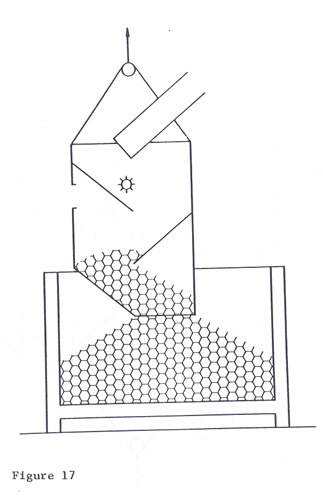 As the filled chute is raised, parts gently out-flow and provide renewed capacity (Figure 17). 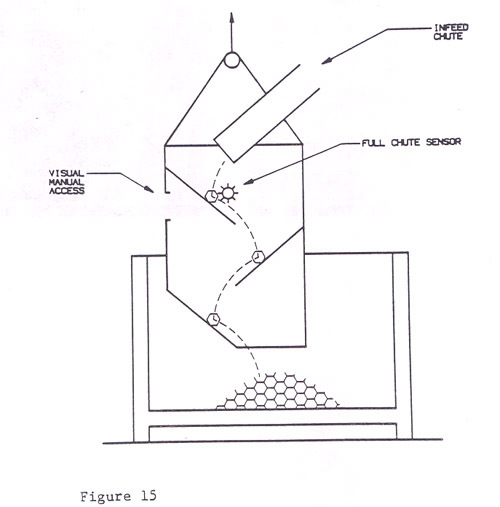 The process of chute fill and lift is repeated until the box is filled (Figure 18). A closure gate can be provided on the down-chute to accumulate parts before their release to a stock box (Figure 19 & 20). Down-chutes can be tailored for one or a family of parts. Exchangeable units are provided where a parts size range demands different baffle patterns. Lifting and lowering of the down-chute can be automatic or manually operated. Movement is normally via an electric chain hoist mounted on a bridge support with a guide for the down-chute and a parking target for gons. Liners in the down-chute are long life, oil resistant, specially selected materials bolted in for quick replacement. Chutes are made of two bolted steel channels for easy service access and bale hung from the hoist. 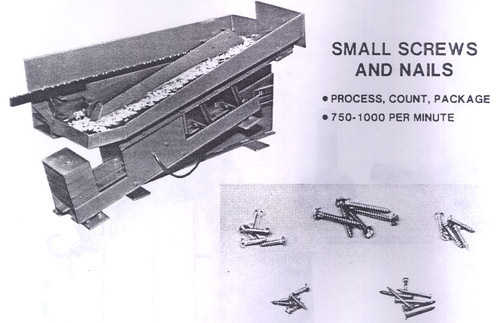 Low or medium height discharge chutes from process machines require elevating conveyors to get parts into the top of the baffled down-chute (Figure 21 & 22). The conveyor’s top end is moved up and down with the down-chute. 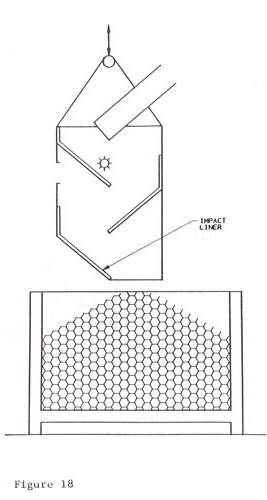 Where process machine out-feed chutes are 30 inches or more, a floorbin elevator can be used to accumulate or through-feed parts (Figure 23). 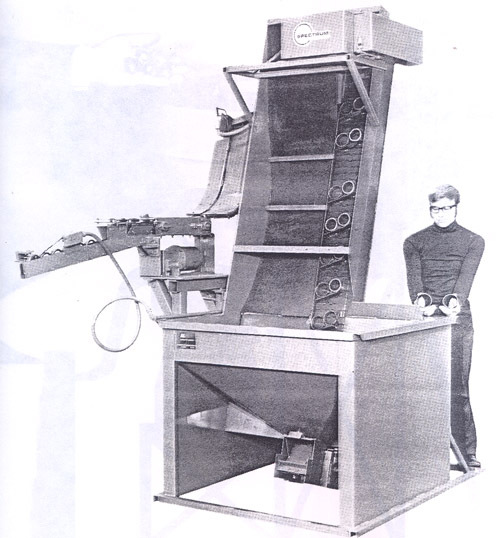 Only the down-chute and its hinged infeed chute move up and down. The baffled down-chute concept has been used with remarkable success in handling valve lifter bodies, spark plugs, and large fine threaded bolts. Several variations of the illustrated concept have been developed to suit special new needs. Most cold-formed parts makers employ very talented mechanical people for tool and die making, general equipment maintenance and special projects. Too often those people are given parts feeding projects founded on limited experience. Their expertise is best used to advise competent, experienced parts feeder sources about needs and specifications for best results. Parts feeder people are continually updating their expertise with new solutions on a daily basis. They already have the scars and medals of battle with parts feeding problems. They are your best source for improved parts handling and related productivity improvement. Gravity orienting floorbin elevators are economically applied to feed simple rolling and sliding parts. Rings and discs are ideal shapes. The vibratory bowl feeder is a popular choice for small complex parts. Photo courtesy of Midwest Automation Services, Inc., Troy, Michigan. Bowl feeder stations usually require a track, bulk meter bin, support structure, and stock loading features. All must be considered to know the real cost to chase and use them. 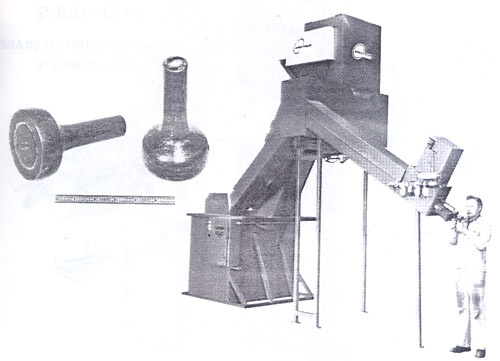 Typical floorbin elevators for bowl feeder stock supply. This family of preforms is fed to a cold former tack by a floorbin elevator, equipped with this straightline orientor tooling shell and interchangeable tooling plates. 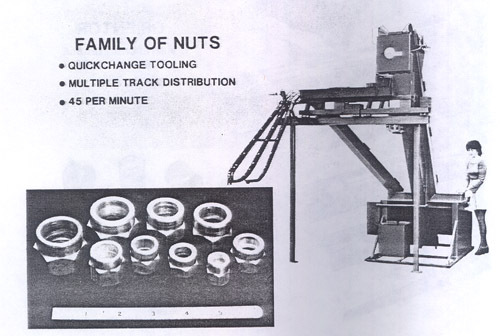 Bolt-in, quickchange orientor, distributor and track tooling, on this floorbin elevator feeds a family of fitting nuts to three process chutes. Changeover takes less than six minutes. This floorbin elevator with vibratory orientor gently handles a family of ball studs without tooling changeover. Parts are oriented, distributed, and released through six feed tracks. Track link bushings, in various cold formed conditions, are loaded into this forty cubic foot storage bin, elevated to two paths, oriented end to end, and to a die lube coating process. A family of parts 2" to 4" diameter x 2" to 6-1/2" long, weighing up to fourteen pounds, are fed at twelve to fifty pieces per minute. Changeover is ten minutes. Steering joint preforms are stored, elevated, vibratory oriented, tracked, and escaped at 40 pieces per minute. These 6-1/4 pound steel parts are efficiently oriented to control part abuse and limit noise at 80 dBa. Two straightline vibratory drives can be set to store and circulate parts through an integral orientor. Such a unit will store more small parts and perform more functions than a bowl. This floorbin elevator uses a batch weight discharge unit to get parts into chemical surface treatment baskets. Parts are elevated from the bin to a counter-weighted collection box. 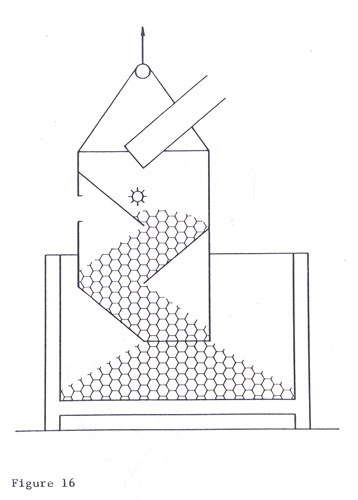 When a preset weight is reached, the feeder stops. When an empty carrier basket signals itself ready for filling, an extension chute moves to the basket opening and parts are released. This stock tub dumper handles gross loads of 6000 pounds. Feeder bin is straddled by the dumper for spill control and minimum use of floor space. With backup storage of a full tub in the dump cradle, stock attention is cut in half. Barrels or gondolas are rotated to fully discharge contents. Dump action can be jogged to flow meter parts. Parts are gently flowed metered from stock boxes and oriented to feed final operations without compromising surface quality. Stocks container is inserted (A), then auto-rotated to flow parts to the fall control fender (B) and metered for orientation.